IRISH SHOPPERS SPENT a record €995 million in December as customers splashed out over the festive period, new figures show. The latest Kantar Worldpanel data shows value sales reached €995 million in the month of December, the highest monthly total ever recorded in the Irish grocery market. This was driven by Irish shoppers spending an average of €694 on groceries in December – €151 more than a typical month. The popularity of classic Christmas staples continued to endure, the figures show, with mince pie sales rising more than 10%. Seasonal biscuit ranges grew by 11% and shoppers spent almost €2 million on Christmas puddings alone. “The fact that Christmas fell on a Tuesday meant shoppers could take advantage of a full weekend of trading before the big day, and Saturday 22 December proved the most popular day for Christmas grocery shopping,” Douglas Faughnan, consumer insight director at Kantar said. For a second Christmas in a row and the fourth consecutive period overall, Dunnes was Ireland’s leading retailer, accounting for 23% of the grocery market – its highest Christmas share since 2013. Dunnes was the only one of the three biggest retailers to see a rise in shopper numbers, with almost 31,000 extra households visiting its stores compared to last year. Tesco followed in second place at 22.3%, while SuperValu came in at third place at 21.8%. Aldi and Lidl were the strongest performing retailers over the 12-week period, with a growth of 8.6% and 4.6% respectively meaning both retailers achieved their highest ever Christmas share. “The impact Aldi and Lidl have made on the ultra-competitive Irish grocery landscape is evidenced by the fact that more than 70% of households visited each retailer in the 12 weeks to 30 December,” Faughnan said. Email “Irish shoppers spent record €995 million on groceries in December”. 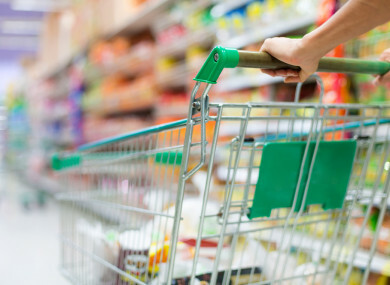 Feedback on “Irish shoppers spent record €995 million on groceries in December”.